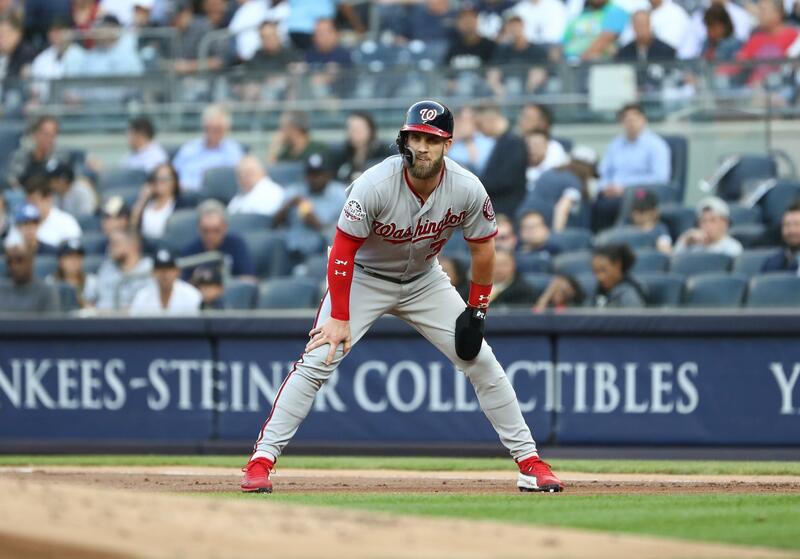 It seems clear that none of Bryce Harper’s known suitors (Washington Nationals, Philadelphia Phillies, Chicago White Sox and San Diego Padres) have yet to meet the outfielder’s desired contract offer, opening the door for the rest of the league to make a bid for MLB’s top free agent. There is increasing buzz that “mystery teams” are starting to get involved, and Fancred’s Jon Heyman has reported that as many as eight teams have been in contract with the the superstar. The idea of Harper settling for a short-term contract at a historic average salary is starting to look more realistic. He’s just 26 years old and could have a shot to land a record-setting deal if he re-entered the market at some point within the next few years. If anyone can afford to pay Harper a ton of money for just a few seasons, it’s the Yankees. New York made sure to stay well below the luxury tax over the last couple of years with the intention of spending big this offseason. The organization has made several additions through trades and free agency, but they still haven’t landed a game-changing player. The Yankees have been pursuing Manny Machado over Harper, but the team clearly doesn’t want to give the infielder the long-term deal he’s seeking. After adding Troy Tulowitzki and DJ LeMahieu, New York might actually have more room in the outfield now than they do in the infield. When asked about the possibility of signing Harper, general manager Brian Cashman indicated to reporters at the Winter Meetings that the Yankees couldn’t be completely counted out. The Giants were once considered to be among the top contenders for Harper. San Francisco has already resisted the idea of becoming sellers this offseason, holding onto Madison Bumgarner in hopes of competing in 2019. It was a little over a year ago when the Giants were ready to commit historic money to an outfielder, but Giancarlo Stanton vetoed a trade that would’ve sent him to the Bay Area. San Francisco could certainly use help in an outfield that features three starters that hit a combined six home runs in 2018. San Francisco is always willing to spend money with the third-highest payroll in the National League. They added Evan Longoria and Andrew McCutchen a year ago in hopes of returning to the playoffs. Harper is younger than both of those players and still in his prime. It’s no secret that the Cardinals began the offseason with hopes of acquiring Harper, and they also tried to trade for Stanton last offseason. Harper appeared to be well out of their price range when it was reported he turned down a $300 million offer from the Nationals. St. Louis traded for Paul Goldschmidt and seemingly moved on, but they could certainly get back into the race if Harper is willing to take a shorter deal. The Cardinals are clearly in “win now” mode after trading a package of minor leaguers and young players for Goldschmidt, who is 31 years old and only under contract for one more season. Yadier Molina is the only St. Louis player making more than $16.5 million this season, and only Dexter Fowler is signed for more than $11.7 million per year beyond 2020. The Goldschmidt trade could make the Cardinals competitive with the Milwaukee Brewers and Chicago Cubs in the NL Central. Signing Harper might make them true contenders in the National League. The Astros have less money on the books for 2019 than all of the aforementioned possible mystery teams. After failing to repeat as World Series champions, Houston lost Charlie Morton in free agency, and both Dallas Keuchel and Marwin Gonzalez could be set to sign elsewhere. Even after giving Michael Brantley a two-year contract, the Astros could stand to upgrade an offense that took a step back last season. Jeff Passan noted for Yahoo Sports earlier in the offseason that “Harper’s affection for the Houston Astros is well-known.” The Astros nearly traded for the superstar in July, according to The Athletic, before Nationals’ ownership shot the deal down. With both sides interested in a union, perhaps a short-team deal could be worked out. It might be one that would make the Astros the World Series favorites.